The best way to prevent the spread of staph infections such as the antibiotic-resistant skin infection or "super bug" known as methicillin-resistant staphylococcus aureus ("MRSA") among football players is to maintain good personal hygiene and avoid direct contact with skin lesions of other athletes. Everyone associated with football teams, including players, coaches, teachers, parents, and administrators, can help prevent sports-related skin infections and should be aware of the prevention measures set out below. Sports team administrators be encouraged to provide facilities and equipment necessary to promote good hygiene, such as clean facilities and adequate supplies of soap and towels. Implement a system to ensure adequate wound care and to cover skin lesions appropriately before play. Launder personal items such as towels and supporters after each use. The water should be at least 160 degrees; washing time should be 25 minutes or more. Encourage coaches to assess athletes regularly for skin lesions. Installing hand sanitizer dispensers in all classrooms. Discouraging nose-picking. The bacteria that causes MRSA thrives in many people's noses, so if you see your child picking his nose, make sure he immediately washes his hands. Trimming nails to help prevent growth of bacteria under nails and cut down on spread of germs from scratches and nose-picking. Thinking twice about asking a child's pediatrician to prescribe antibiotics for the flu, or another virus, an ear infection, or adolescent acne. Why? Because, health officials say, the overuse of antibiotics has contributed to the resistance staph bacterium have developed to the most common antibiotics. Indeed, the growing public concern about MRSA has prompted many dermatologists (fifty percent, according to one report) to cut back on the use of antibiotics to treat acne. *While there are, as of yet, no clinical studies to confirm the results, a laboratory study conducted at the College of Pharmacy at Oregon State University (OSU) presented at a December 2007 meeting of the American Society of Health-System Pharmacists found that an ointment containing benzethonium chloride with tea tree and white thyme oil worked best against all four tested MRSA strains, while ointments containing neomycin, polymyxin, and gramicidin also had some antibacterial effectiveness. "We know that it takes a large number of bacteria to ultimately produce an infection, and antibacterial treatments can greatly reduce their number" said David Bearden, a clinical associate professor at OSU. "It's reasonable to believe that these products, which are inexpensive and easily available, have a place in protecting a nasty cut or scrape and trying to prevent a more serious infection." 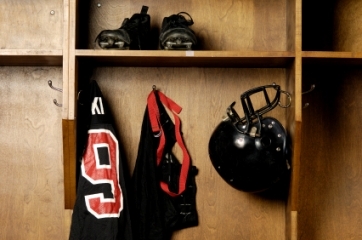 The best way to prevent the spread of staph infections such as the antibiotic-resistant skin infection or "super bug" known as methicillin-resistant staphylococcus aureus ("MRSA") is to maintain good personal hygiene in football locker room, schools and at home.